If there's one thing almost every smartphone user wants, it's longer battery life. While processors, memory and other components have advanced in leaps and bounds, progress in battery technology has been much slower over the last couple of decades. All those people you see charging their phones at airports, coffee shops and other public places are a testament to how often batteries die out during the day. So while engineers are fighting against basic chemistry and physics to improve current Lithium Ion cells, is there a better way to recharge? One answer might be fuel cells, which generate electricity through a chemical reaction and provide instant power anywhere. Unlike portable battery packs, they don't need to be charged in advance. You just need a fuel cell cartridge. The promise has been there for some time. A few years ago, electronics companies tried to popularize fuel cells based on methanol but they failed to take off. This time around, the focus is on hydrogen. As hydrogen gas enters the fuel cell through a membrane, the electrons are stripped off and travel through an external circuit -- that's the flow of electricity. Upon exiting the fuel cell, the electrons are recombined with the ionized hydrogen and oxygen from the air, so the only by-product is water. There's already one hydrogen fuel cell on the market, with another promised for this year. Both were on show at this week's Mobile World Congress in Barcelona. The main difference between them is in how the hydrogen is packaged so it's safe to handle. Intelligent Energy's Upp stores it in a metal hydride compound that's contained in a cartridge that snaps onto the fuel cell with magnets. Each cartridge is good for about 5 recharges of a smartphone and once exhausted should be returned to an exchange station for a fresh one. The fuel cell, which is already on sale at Apple Stores in the U.K., costs £149 (US$228) and each cartridge is £6 (US$9). One downside: its heavy. The fuel cell and cartridges weigh 620 grams (1.3 pounds), and that's not something you want to carry in your bag all the time. The Jaq prototype from Sweden's MyFC gets its hydrogen from a disposable cartridge that contains salts and water. It will cost around €75 (US$81) and the disposable cartridges will be about a euro each. Each will provide a couple of charges for a phone. The MyFC appears a more attractive package and is cheaper, but its unproven technology. It wont be on sale until late 2015, so well have to see if it lives up to promises. And talking of living up to promises, about 10 years ago, several major electronics companies were developing fuel cells that ran on methanol. 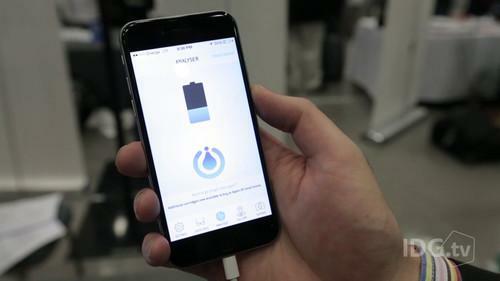 The promise was the same: on-demand charging of gadgets no matter where you were. Toshiba even put one on sale in Japan in 2009, but it all went no where. Getting people to buy them, and supplying the methanol, just wasnt as easy as charging a phone with a few AA batteries, or waiting until a power socket was available. Those same challenges remain today. Ten years on, the newer technology and lower prices might make fuel cells more attractive, but whether they'll really catch on appears just as uncertain.